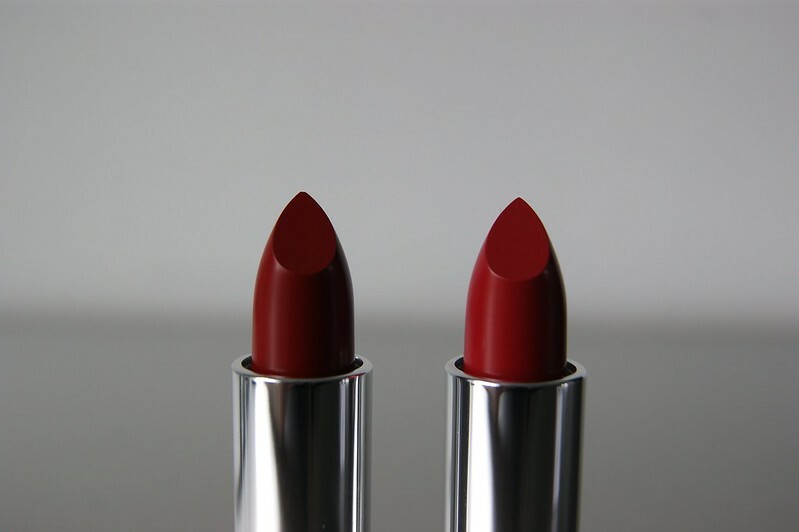 The lipstick on the left is 'Ducape Red' which is supposed to have a creamy texture and finish, while the lipstick on the right, 'Luxor Red', is supposed to have a matte finish; which is just the way I like my lipsticks. The ingredients, which I know nothing about. If you do, please share your info in the comment box below. It's always nice to learn new things! 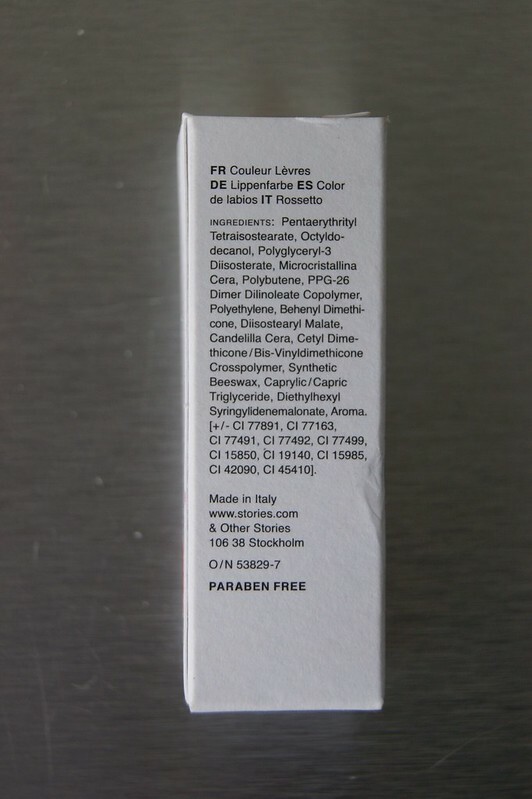 Oh, before I forget: the lipsticks are paraben free. 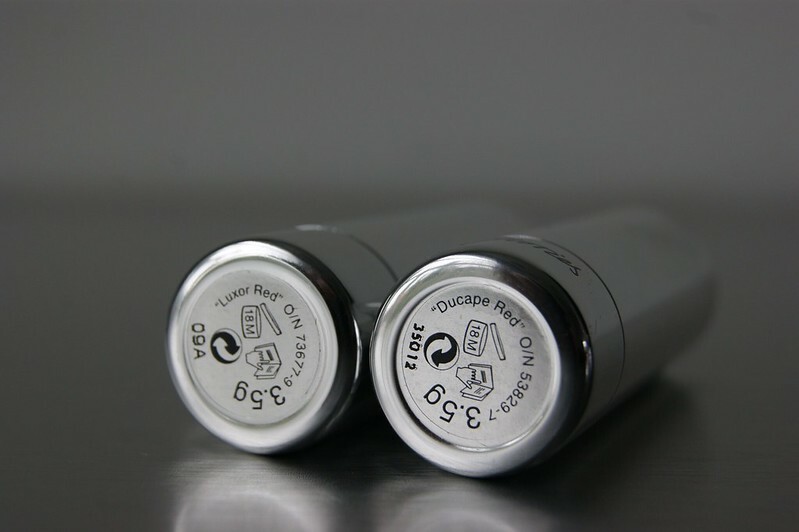 The lipsticks come in simple, silver packaging. I've never been one to pay a lot of attention to it, it's the inside that counts, right? I do love that the names are written on the bottom of the tap and that both top and bottom are flat. This way, you can place the lipsticks standing in a box or drawer and you immediately see the lipstick you need. Time for some swatches! 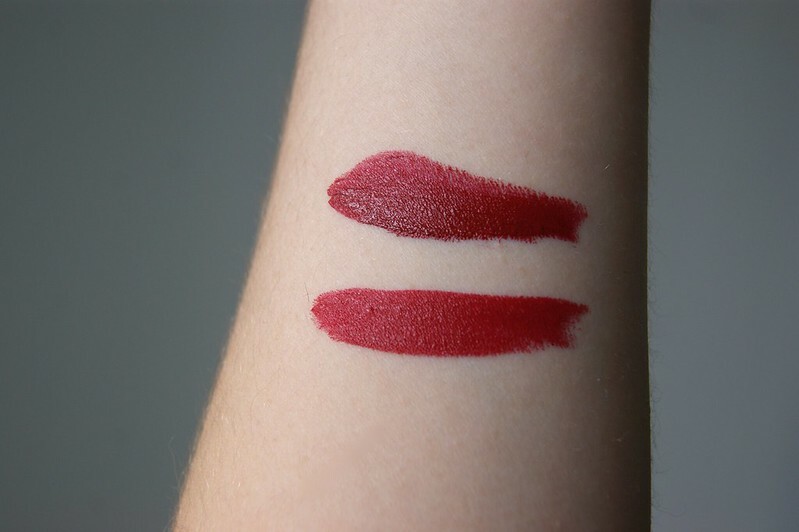 The swatch on top is 'Ducape Red' and the bottom swatch is 'Luxor Red'. As you can see (hopefully), 'Ducape Red' has a more brownish tone to it, which makes it a color that's more suitable to wear in winter -- Please note that if you want to wear this color in summer too, be my guest! I'm just giving my own, personal opinion in this article. 'Luxor Red' is a bright red color. 'Ducape Red': Made me realize why I tend to stick to lipsticks with a matte finish. Don't get me wrong... I love the color, but I just can't seem to get used to that creamy feeling on my lips. Plus, the lipstick itself got a watery touch to it in the tube, as if someone had dropped it into some water. Nope, didn't like it. Plus, I hate it when I step outside and the wind blows my hair all over the place, getting it stuck in my creamy lipstick or lipgloss. 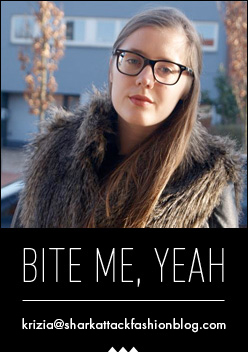 That's so gross and you don't have that kind of problem with matte lipsticks. Anyway, if you are a fan of creamy lipsticks, lipsticks à la 'Ducape Red' are perfect for you. Aha, there's the matte! I'm not sure if I like the fact that I have to use a tissue to receive the matte effect (matte is matte, right? ), but I think it would've been worse if there was no effect at all. However, I have a feeling that I will somehow still grab my instant matte lipsticks before this one. Bummer. And now... *Drumroll* ... The final verdict! 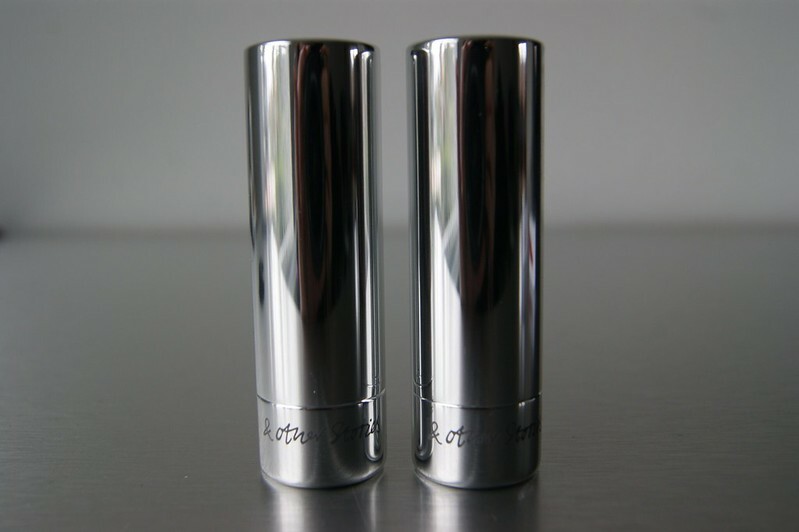 Both lipsticks are gorgeous colors and have great pigmentation. 'Ducape Red' is too creamy and therefor not my cup of tea -- just a personal / issue I have, it's nothing personal. The fact that the packaging says that 'Luxor Red' is a matte lipstick, but it isn't really unless you bite a tissue, kinda bothers me. I own tons of other lipsticks that reach that matte effect immediately, which definitely limits the chance of me reaching for 'Luxor Red' again. 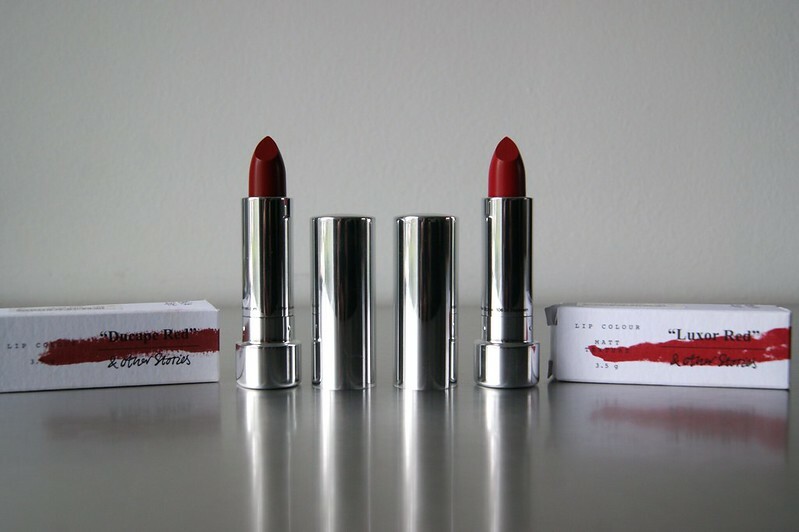 & Other Stories lipsticks are available in the & Other Stories stores. red lipstick is my weakness! these colors look really rich and beautiful! bummer that the matte was not as matte looking as you wanted though. I love the red color ! Looks nice ! I really like the luxor red color! Very bold. comment here so I won't miss your blog ! Ik zie de matte finish om eerlijk te zijn ook niet echt, maar toch vind ik Luxor Red een érg mooie kleur! both look good!! so rich and luxurious!! wish we had & other stories here so i can get a hold of these lipsticks! Lovely colours it looks great. Wish to check out my blog. Wauw ik vind beide kleuren echt verschrikkelijk mooi. Jammer dat ze allebei niet matte zijn, want dat vind ik wel het mooist.